World-class artisans are making cheese in almost every corner of America, from Oregon to Georgia. Here, the best American cheeses appear alongside their European counterparts in a truly international cheese course. The perfect cheese plate should include a mix of fresh, aged, soft and hard cheeses, arranged in the order in which they should be tasted: from the lightest and freshest to the ripest and most intense. Here, cheese expert Laura Werlin lists cheeses by style, starting with fresh cheeses and ending with washed-rind cheeses. 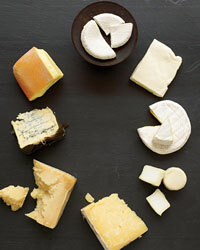 Fresh cheeses are ready to eat as soon as they are made—no aging required. They generally have the mild, minerally flavors of their primary ingredients: milk and salt. To create this silky chèvre, the cheesemakers hand-ladle curds made from the farm’s goat milk into basket molds to drain (). Crème fraîche gives this cottage cheese its tang and richness (). The Crave brothers milk their own herd of 600 cows for their buttery mozzarella (). Salty and crumbly, the sheep’s-and-goat’s-milk feta is a natural for salads and egg dishes. Unspun mozzarella curds and cream give this fresh cheese a soft center that oozes when it is cut open. It’s perfect with tomatoes and olive oil and decadent enough to eat on its own. Mild semisoft cheeses are most often aged from a few days to a few months. They melt beautifully under the slightest heat. This handmade cheese has the perfect semisoft texture: creamy yet firm (). Franklin Peluso’s masterful cheese, dusted with rice flour on the outside, is oozy-soft within (). This American take on the Danish cheese is great in a grilled cheese sandwich (). Beneath its firm (inedible) rind, this citrusy raw cow’s-milk cheese, which was first produced in the Welsh town of Gorwydd, changes in texture from firm on the outside to soft at the center. This Corsican cheese, traditionally made with sheep’s milk, is fragrant with a coating of rosemary, juniper berries and other herbs. Its texture evolves from creamy to semihard as it ages over three months. Distinguished by their white "bloomy" rinds and creamy interiors, soft-ripened cheeses get softer instead of harder as they age. The best-known are Brie and Camembert. This cheese produced near the Georgia-Florida border gets its sweet, grassy flavors from the pasture that feeds the herd of Jersey cows at nearby Green Hill Dairy (). A light, lemony goat cheese from the makers of perennial favorite Humboldt Fog (). Launched in May 2006, Mt. Townsend has been garnering praise for its complex cheeses, like the creamy, citrusy, cow’s-milk Seastack (). Noted for its rich, buttery flavor, this double-créme cow’s-milk cheese isn’t a Brie but has been produced in France’s Brie-making region since 1929. This silky cheese from Piedmont is a blend of sheep’s and cow’s milk. Its mild flavor makes it versatile enough to serve with sweet dried cherries and figs or with savory mushrooms. Surface-ripened cheeses are sometimes firm and sometimes molten, but they all have similarly wrinkly rinds and intensely flavored interiors. Special molds ensure that their exteriors ripen first. This unctuous two-ounce goat’s-milk round was introduced in 2006. Unwrap it and store it in the fridge, and it firms up to become a fantastic grating cheese; keep it covered and it just gets creamier (). Famed Louisiana chef John Folse’s superrich Guernsey cow’s-milk cheese evolves over time from firm to pure liquid (). Pierre Kolisch makes this earthy, slightly chalky, pyramid-shaped cheese from raw goat’s milk (). Often called the “Eiffel Tower” because of its pyramid-like shape, this Loire valley goat cheese is tangy, herbaceous and earthy. This irresistibly creamy cheese gets its delicate flavors from cow’s, goat’s and sheep’s milk. It is so deliciously soft it can be eaten with a spoon. A broad category ranging from cheddar to Gouda, semihard cheeses can be aged anywhere from a few months to a few years, and sometimes longer. A cheddarlike cow’s-milk cheese, Beecher’s Flagship Reserve develops its nutty, sharp flavors while it ages in cloth wrapping for at least a year (). This goat’s-milk cheese is sweet, like many Dutch Goudas, and nutty, like an aged Italian cheese (). An Alpine-style, golden, grassy cheese made from the milk of mixed-breed cows (). Though often compared with cheddar, this English cow’s-milk cheese developed by dairy farmer Simon Jones has a creamier texture and tastes more mellow and sweet. It’s delicious with walnuts or apples (). A firm Catalonian cheese with the signature tang of goat’s milk, Garrotxa has an earthy aroma and is a terrific choice for cooking. It adds flair to pasta and pairs well with serrano ham for a Spanish-inspired grilled cheese sandwich. 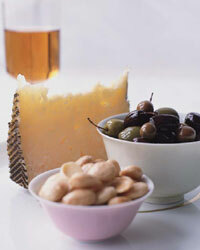 Hard cheeses like Parmigiano-Reggiano are defined by their firm, granular texture and salty-sharp taste. SarVecchio is the closest thing to an American Parmigiano; moister and less assertive than its Italian cousin, it has a great balance of nutty, salty and caramelly flavors (). Loosely translated as "handmade cheese," sweet-tart Queso de Mano was this goat dairy’s first raw-milk cheese (). This Gouda is made in the Dutch "Boere Kaas" (farm-made) fashion with unpasteurized cow’s milk (). This caramelly, long-aged Dutch Gouda is crunchy with crystals (tiny protein clusters). Nutty and sweet, this aged cow’s-milk cheese is more mellow than classic hard cheeses like Parmigiano-Reggiano, but it’s just as lovely grated on pasta or served in chunks as part of a cheese plate. Blue cheeses get their color from rich veins of mold and range in texture from creamy to creamy-crumbly to hard. Rogue Creamery’s herbaceous, salty-sweet raw cow’s-milk cheese is aged in Syrah-Merlot grape leaves that have been soaked in pear brandy (). This bacony blue made with sheep’s milk is a perfect example of the crumbly style (). Cayuga Blue gets its minty, lightly spicy flavors from the milk of this small dairy’s own goats (). Ireland’s first farmstead blue cheese, first developed in 1984, is surprisingly sweet, with a crumbly yet creamy texture (). This excellent cow’s-milk double- (almost triple-) créme blue cheese was judged the best in New Zealand among 500 competitors in 2006 (). These cheeses get their characteristic orange-pink rinds from being "washed" (rubbed, really) with a solution of salt water and beneficial bacteria. Often described as stinky (in a good way), washed-rind cheeses can smell stronger than they taste. Made from the milk of Jersey cows, this soft, square-shaped cheese has earned a cult following for its beefy brown-butter flavors (). This mushroomy, yeasty cow’s-milk cheese comes from mother-son duo Elizabeth MacAlister and Mark Gillman (). A pyramid-shaped raw cow’s-milk cheese, caramelly Sarabande is aged for 60 days (). This cow’s-milk cheese, made by the same Trappist monks who produce Chimay beer, has a noticeable salty tang and a delicious crunchy exterior (). Made from cow’s milk, this golden-colored, semisoft cheese has a somewhat mushroomy flavor (). Laura Werlin is the author of four books on cheese. Her most recent is Laura Werlin’s Cheese Essentials.